This is my basic portfolio. If you're in the market for a webpage and you like what you see, please email me at myrna@foxglovetonic.com. Eventually I plan to add information on my other pasttimes and passions -- art and craft, genealogy, probably strawbale and other alternative methods of home construction, and whatever else I might decide to focus on here. 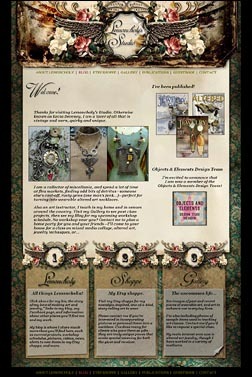 I'm redesigning jewelry/found object/eclectica artist Kecia Deveney's website, as she finds time. The site artwork, which I've tweaked a bit, was generated by an art template designer. I've cleaned up the layout and wrote/edited a lot of textual content. Kecia's site will feature a more complete view of her work and accomplishments. Launched on January 1st of '06, this is a band website for the Floating Glass Balls. Medium-sized. Updated frequently. As Joyce Maynard's webmistress from June, '98 to September, '09, I generated dozens of pages for her website. The new mistress is new to web design so is using basic host-supplied templates. I'll try to get some webshots of my work up soon. Another large site for another writer, done in 2002. I designed her logo, too. At the end of 2008, Sue decided to hire a neighbor to maintain her website. I'm sure there will be changes over time, but, for now, the site is basically as I designed it. 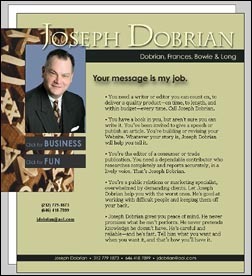 A website for another talented writer, Joseph Dobrian. We launched a complete redesign in February of 2010. There's a lot of organization and content here (generated by me). though the sit is in need of a visual overhaul, which I'm working on as time allows. Very infrequently updated; the band lives on, though the members are all busy with other projects and they don't play as often as they once did. This is a very scaled-back version of the Upper Left Edge. Used to be quite the production. Editor Billy Hults achieved the speed of light in 2009, with Uncle Mike Burgess following in 2010. They are very much missed. I haven't decided yet what to do with the website, though I would like to eventually replace much of the content from the old newspaper, which featured a lot of creative writing. Disbanded, though Heather still performs. Look for her in "One Night in Frogtown" productions, as well as on the recording which accompanies the book, written by Emmy-winning author/composer Philip Pelletier. Michael Burgess and Reverend Billy Hult's last project, the non-profit Tolovana Arts Colony carries on, and is doing very well. This site was launched on January 1st, 2006. They provide low-cost classes and workshops on a variety of artful subjects. A companion site to RevWriter.com. Isa Haverlan's massage therapy website, done in 2004.